In Kosovo’s capital, Pristina, the name Clinton is ubiquitous. But it is not just Bill who is beloved here. 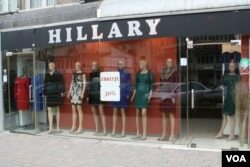 Hillary, too, has been honored with two clothing stores that bear her name. From outside the shops, several bald, expressionless mannequins wearing outfits inspired by the former first lady can be seen in the display windows. Step inside, and the desire for Hillary to succeed in the presidential primary elections and caucuses — which begin next week — and become the next leader of the United States in early 2017 is unquestionable. Kosovo’s reverence largely stems from the support Bill Clinton provided the territory during its war against the Federal Republic of Yugoslavia, in 1999. At the time, the country consisted of present-day Serbia, Montenegro, and Kosovo. US-led NATO bombing ended a campaign of killing by Serbian forces against Kosovo’s ethnic Albanian majority, which eventually led to Kosovo declaring its independence from Serbia in 2008. While it is generally believed serious instability in Kosovo’s near future is unlikely, ongoing tensions in the region mean the possibility cannot be ruled out. Lura Limani, editor-in-chief of English language newspaper Prishtina Insight, agreed American support would be important in any future altercation, but believes it would be provided regardless of who is elected president later this year. “The US foreign policy towards Kosovo, or as we like to see it, towards Albanians, has been consistent throughout the twentieth century,” Limani highlighted, “so in that sense I don’t think any sort of election in the U.S. can really change much. And I don’t think that that has happened in the past. After Clinton, Bush as well was very popular here." George W. Bush was one of the first world leaders to recognize Kosovo’s independence. 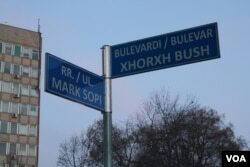 As a reward, he too had a Pristina street named after him. Limani said Kosovars will be closely following this year’s presidential race. Hoti also said Kosovars look towards the United States — especially at election time — as an “ideal model” of democracy, as they try to build a strong democratic state of their own — a task proving to be difficult. 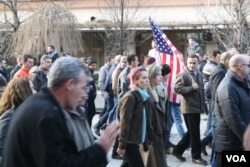 Kosovo is experiencing its worst political crisis since declaring independence. Thousands took to the streets of Pristina earlier this month to denounce the country’s elected officials, eventually setting fire to the government’s headquarters. Since October, opposition members of parliament have attacked the chamber with tear gas nearly half a dozen times to protest an EU-brokered deal that provides Serbian-majority municipalities with more autonomy. The opposition has vowed to continue protesting until the government resigns. However, as there are no signs the current administration will acquiesce, it appears the only elections Kosovars will be witnessing any time soon are those in the U.S.